Married couple who have professional careers but love to travel. Trying to find more PTO to explore the world. My love of traveling started at a young age. I was fortunate enough to go on a few international trips while in high school. My freshman year, I went to England, France, Switzerland, Belgium, The Netherlands, and Germany through People to People. The next year, I traveled to Australia through the same organization. My senior year of high school, my parents and I went to England and France over Christmas time. I have always loved going to new places and international travel is always exciting. 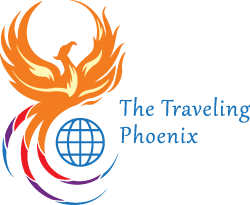 We chose the Phoenix because every time we travel we have a new appreciation for not only other countries, cultures, and traditions but also for our own culture and where we come from. Why the Colors of the Phoenix? We chose to make the Phoenix colorful to represent the different places we have visited of cities and remote places but also getting exposure to different cultures and meeting people for different places.